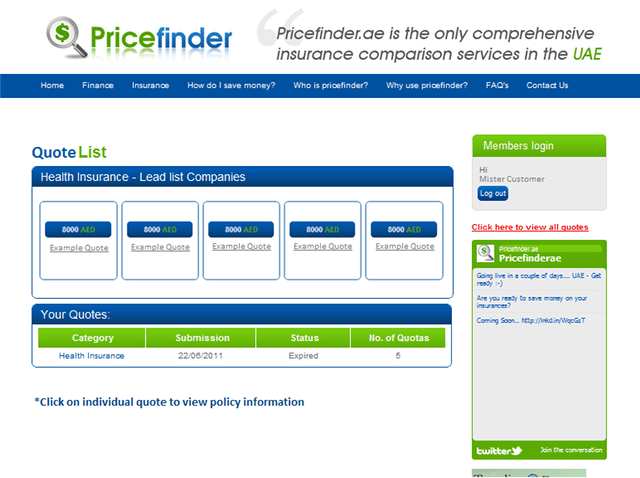 Back in April we covered Democamp Dubai and one of the demos that caught my attention was Pricefinder which is a comprehensive insurance comparison website. Initially the demo displayed was functional however the design was still not there. That’s not the issue anymore, they have completely revamped the design and now are in the final stages of testing and should go live to the public within a week or two. I had a chance to meet with one of founders late last week and he was kind enough to share with me some screenshots of the website, as you can see from the homepage below the design is very clean and neat. You can tell what Pricefinder is right away you don’t have to guess and snoop around to figure out what you want to do, everything is clear and easy. 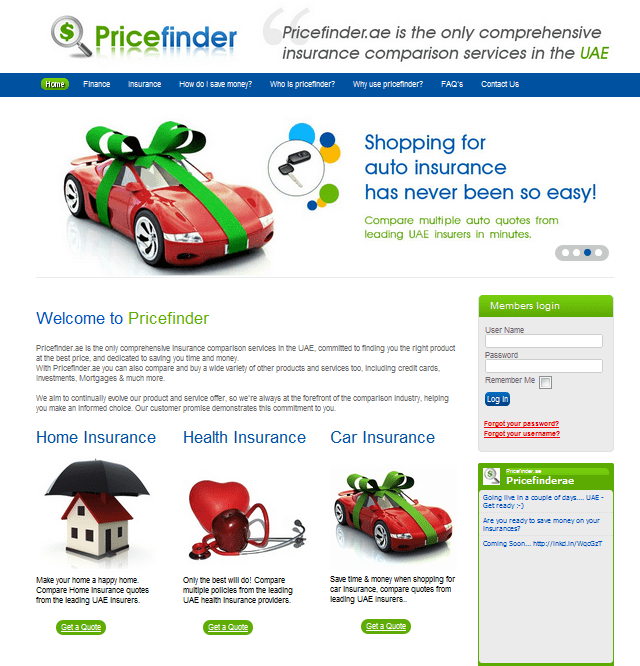 Back in April pricefinder was mainly for comparing car insurance, but it seems that users will also be able to compare Health and Home insurance in the UAE as well. 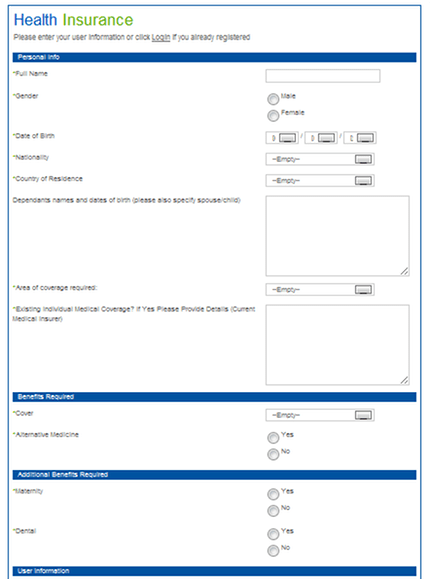 How it works is very simple, just like any service you would have to fill in a form, these forms might seem lengthy but it beats contacting every insurance company and broker in town. Plus you would have to give out almost the same information over the phone but with Pricefinder you fill them out once and you’d be able to get the best five rates. Once a user enters their complete information Pricefinder will provide them with the best five quotes within in a couple of hours. Users can then view and manage their quotes from their accounts (screenshot below), however you cannot purchase the insurance policy online just yet because of complexities in the payment gateways and logistics of it all. But you will get the contact information for the quote you prefer. Pricefinder will be launching in the UAE only, however there are plans to take it across the GCC and the rest of the MENA region within the upcoming months. Would you use Pricefinder? Let us know why? I agree with Peter. 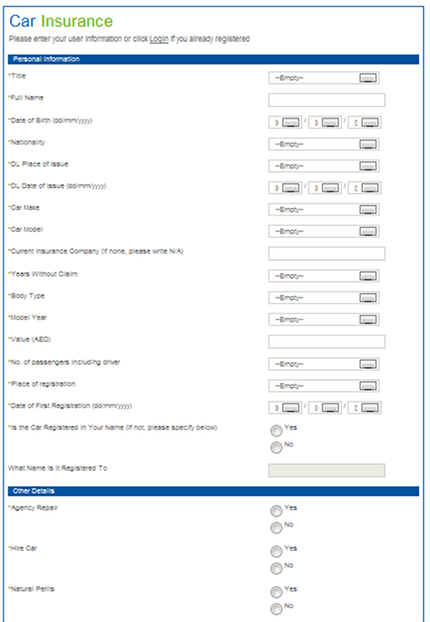 Just insured my car – and I got to choose which one I wanted after completing only 1 form! I need to review my Health Insurance next month, I'll keep you updated on how I get on. Just bought car insurance, and what a nightmare trying to get the best prices.